The best moments so far and the matchups to come. 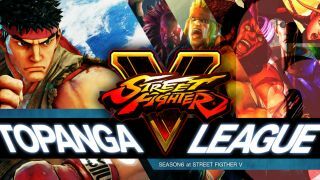 Running its sixth event, the Topanga League has always been the home for the highest level Japanese Street Fighter play. Twenty one of the very best Japanese pros face off in the round robin, which runs from February 10th to March 5th. It’s a fascinating event, as it has a few unique rules that make it very different from normal CPT-style tournaments. For starters, the entire thing is character locked. Players pick their character before a single match has taken place, so all of the competitors are true character specialists. Daigo, who has been playing Guile recently (even declaring the character ‘perfect’) has opted for his classic Ryu. StormKubo is going to try and perform a miracle by going with the hideously-nerfed Alex. This is also the first tournament where we’ll see Tokido reunited with his USFIV main Akuma. The league itself is split into three different sections. First of all there's the online league, where the players all play, unsurprisingly, online, with the first place player advancing to the finals, second through fifth go into an offline league and the others are eliminated. Next there's the offline league, where only first place qualifies for the finals. This is where things get more interesting. These matches are a first-to-seven, but must be won by either a two-game berth or by hitting 10 wins. Finally, the final six play in a league under the offline league ruleset to decide who is grand champion. It’s a long, gruelling tournament that really shows off each player’s skills, as they adapt and change the way they play over these long sets against their opponents. You’re more likely to see hard fought, back and forth battles when players of this ability have a chance to figure out their opponents, rather than the usual CPT tournament first-to-three rule. Topanga has traditionally been a bit of a pain to watch, as it is usually on a Japanese pay-per-view streaming site which requires you to have Japanese banking details to subscribe. This meant that you had to go looking for a re-stream, provided it hadn’t been shut down. This year, however, they’ve partnered with OpenRec.tv who are providing a free stream of the entire tournament with full English language commentary. 2017 is the year to watch yourself some Topanga, and so far it has been absolutely brilliant. The biggest shock of the event so far is Daigo Umehara going 0-6 using Ryu. He’s played more games than anyone else so far because he’s flying out to San Francisco to take part in the Lupe Fiasco album launch party (yes, really), but it hasn’t been going particularly well for The Beast. Many are crying conspiracy—they think that this is Daigo protesting Ryu’s nerfs in the Season 2 patch, perhaps sending a message to Capcom to buff the character in the surprise rebalancing patch, set to be detailed at the start of March. That's probably a load of rubbish, though. There was an amazing moment in his match against Go1, where he attempted to recreate his legendary full parry of Chun-Li’s Critical Art. He almost nailed it, too, but fluffed his lines when he went for the punish slightly too early. That moment summed up Umehara’s Topanga to date. He's going home early. In Group A, Haitani sits at the top of the pile with the only perfect 3-0 record in this stage of the tournament. Sticking with his Necalli in season 2 despite the character receiving some nerfs and seeing some Necalli mains start focusing their attentions elsewhere, he’s made fairly short work of Daigo, Tokido and Nemo. A very impressive start and right now, it’s not looking like anyone will stop him from being the first to auto-qualify for the final league. Joint top in Group B are Galtu, who plays Dictator, and recent Echo Fox signing Momochi, who is arguably the World’s best Ken player. Galtu has the slightly better game record, but his sole loss comes to, of course, Momochi. Momochi’s loss was against the tournament’s only Rashid player, Gachikun. Group C is topped by Evo 2016 finalist Fuudo, who has stuck with R.Mika—one of the characters hit hardest by nerfs in Season 2—and is making her look absolutely deadly. He’s had to adapt to the fact that her greatest trick (the ability to get a corner bounce mid-screen) is now gone, which led a lot of people to think that the character was done for. Fuudo is providing compelling evidence that that may not be the case. So far, his only loss came against YHC-Mochi, Japan’s best Dhalsim player. The player absolutely worth watching is Itabashi Zangief, who obviously uses ‘Gief. His wins so far have been incredibly exciting matches. Japanese players consider Zangief to be one of the best characters in the game since the season 2 patch. But I put this to you—do you see a vastly improved character, or a player making some incredible but highly risky hard reads? We’re already a weekend in, but with the action kicking off again at midday on the 17th, we’ll be seeing the final few Online League matches played out over Friday and Sunday. After that, it is on every Friday, Saturday and Sunday until we have a winner in the first week of March. As a self contained tournament it’s a great place to get into watching competitive Street Fighter if you’re on the fence, and serves as an excellent warm up before the Pro Tour kicks off again in March.